The Berlin Wall wasn’t very warmly received when it first went up and this year marks the 20th anniversary of its downfall but rebuilding it (virtually) is proving to be a much-needed publicity draw for virtual world Twinity. Metaversum, the Berlin-based company behind virtual world Twinity have constructed a replica section of the wall in-world as a kind of topical exhibition. 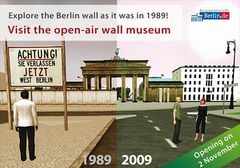 Twinity’s virtual Wall stretches from the Reichstag to checkpoint Charlie and is as realistic as possible with embedded video and audio guides at certain points. We don’t know if Twinity players will be able to tear the wall down on the anniversary of its fall on the 9th November. The Wall reconstruction has brought some useful publicity to Twinity – a virtual world is pegged closely to the real world. Twinity’s city scapes are modelled exactly on real cities – Berlin, Singapore and soon London and the game allows people to walk around real streets and create fake apartments, flowershops or pubs. The idea of disgruntled second-lifers, Twinity hasn’t fully taken off with players complaining that there’s little to do. We’re interested to see what they’re going to do when the site launches a virtual London.